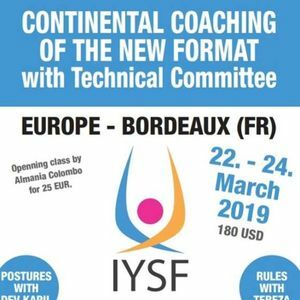 IYSF (International Yoga Sports Federation) and AYSFA (Association du Yoga Sportif France Aquitaine) organise during 3 days a European Coaching workshop for all yogis, adults or kids, wishing to participate in Yoga Sports Championships. This seminar is also for every person wishing to go deeper in his yoga practice, or wishing to become a IYSF official judge in yoga sports competitions. In order to become an official IYSF coach, you have to participate in this event. Almania Colombo : Double World Champion and the reference in today's Yoga Sports world. We hope to see you very soon in beautiful Bordeaux !